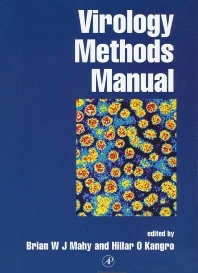 The Virology Methods Manual is a comprehensive source of methods for the study, manipulation, and detection of viruses. Edited by Brian Mahy and Hillar Kangro, this work describes the most up-to-date, definitive techniques, provided by experts in each area, and presented with easy-to-use, step-by-step protocols. This new manual will satisfy the needs of virologists and all those working with viruses who need a practical guide to methods that work! Research scientists and research clinicians working in the field of virology will find this book useful. It will also be of interest to molecular biologists and immunologists, to the infectious disease community in general, andto biotechnology/pharmaceutical companies. V.C. George, J.C. Hierholzer, and E.W. Ades, Cell Culture. J.C. Hierholzer and R.A. Killington, Virus Isolation and Quantitation. J.C. Hierholzer, R.A. Killington, and A. Stokes, Preparation of Antigens. R.A. Killington, A. Stokes, and J.C. Hierholzer, Virus Purification. M. Chernesky, Traditional and Serological Tests. M. Chernesky and J. Mahoney, Immunoassays. A. Mawle, Cell Mediated Immunity. J.E. Novak, T.C. Jarvis, and K. Kirkegaard, RNA: Transcription, Transfection, and Quantitation. D.J. McCance, DNA Viruses: DNA Extraction, Purification, and Characterization. K.N. Leppard and C.R. Pringle, Virus Mutants. D.R. Harper and B.F. Coles, Polypeptides. M. McCrae, The Assay of Viral Enzyme. A.L. Jabri, D. Wigg, and J.S. Oxford, Initial In vitro Screening of DrugCandidates for their Potential Antiviral Activities. S. Specter and D. Jeffries, Detection of Virus and Viral Antigens. J. Mahoney, Detection of Viral Nucleic Acids in Clinical Material. S. Specter and D. Jeffries, Serological Methods. S. Specter and D. Jeffries, Disinfection. Appendices. Subject Index.